Centralized food production does not equate to food security for a nation, and micro farms, producing relatively expensive, high-quality foods do not either. Don't misunderstand me. I love the current renaissance of small-scale, localized agriculture. But micro farms do not feed most people in America, and they will never feed the dependent masses crammed into the urban centers of the nation. This week, Dean Foods gave notice to 140 small family dairy farms in Michigan, Indiana and Ohio that after May 31 of this year, there will be no truck to pick up their milk. Walmart, the largest buyer of Dean’s milk in the region, has vertically integrated and will now be processing their own milk. But not from those farms. Those farms are too small for Walmart to waste their time with. And now, Dean has no avenue to sell those farms’ milk. After years of low prices, it is, likely, the final nail in the coffin for those farms. Family dairy farms have been going out of business in America for decades. Most of these farms are (or were) operated by the same family for several generations. But I think we might be experiencing a new wave of farm losses. I couldn't find that film on Netflix or Amazon. So I paid $5 to watch it online at the film's website. If you have any interest in dairy agriculture, you'll appreciate the movie. It's well made, with an important message. I especially liked the fact that one of the farms featured in the movie is Herrick Farm (a fine name!). It has been in the same family for 300 years. They milk 100 cows. They own 140 acres and rent another 200. 100 cows is an average-size family dairy in the New England states. Fewer than 2,000 such farms remain in New England. 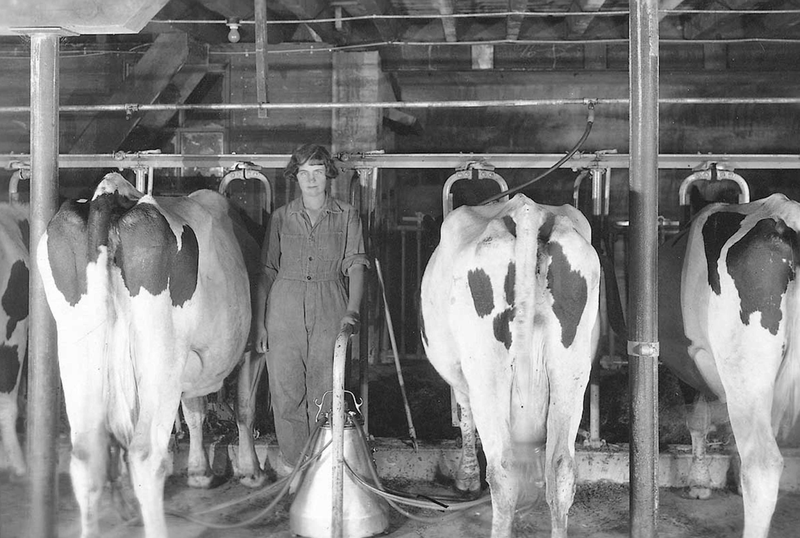 50 years ago, there were 10,000 dairy farms. The movie explains that 75% of New England's pasture and crop land (that which hasn't yet been swallowed up by urban sprawl) is managed by dairy farmers. These farmers are taking care of the land, and keeping it out of development. Dairy farms are the economic backbone of agriculture in the New England states. They produce enough milk to supply the needs of people in that region, and more. Meanwhile, diversified microfarms connected to the burgeoning local food movement produce about 3% of the food consumed in the New England states. According to the movie, New England imports 90% of its food. One problem that Forgotten Farms points out is that family dairy farms (in New England) are not recognized for their important contributions to the agricultural economy. The new breed of micro farms are better with their marketing and public relations, so they get the recognition. Since such a small portion of the American population is involved in dairy agriculture (compared to in the past) few people are aware of, or care about the difficulties that small dairy farms are experiencing; their main difficulty being the ability to make enough money to stay in business. All most people know about conventional dairy farms is that they stink. And dairy farmers are looked upon as a lower class. The deck is stacked against family-scale dairy farms. I worked on a small dairy farm (around 75 cows) for a year after high school. The work was hard, and there was no end to it. I have a lot of respect for any small dairy farm trying to make a go of it in America today, and I grieve the loss of these farms. How can conventional dairy farms manage to survive in a centralized agricultural system that is squeezing their profits and driving them to either get very big, or get out of business? Well, they're going to have to do what the aforementioned Herrick Farm in Rowlee, Massachusetts is currently doing. They are augmenting the loss of income from their dairy (hoping the price they get for their milk will eventually rise) by tapping into the local-food and micro farm movement. With the enthusiasm and energy of the younger generation of Herricks, the family dairy farm is now raising and marketing their own beef, eggs, poultry, produce, and so on. Judging from the demographic information for Rowlee, they have the high family income and population density needed to buy the higher-priced Herrick Farm products. So, Herrick Farm will probably survive this crisis (as long as people in their area continue to have the money to pay the higher prices), but a lot of other small dairy farms will go out of business. My point here is that micro farms do not feed the majority of Americans, and the continuing loss of conventional small farms (most of them being dairy farms) does not bode well for the future of this country. It's just a crying shame. A few hours after posting this, I became aware of this article in the NY Times: When The Death of a Family Farm Leads to Suicide. It is about the impossible struggle that some dairy farmers in my state (New York) are facing. What struck me the most about this post is that 75% of the pasture and crop land in New England is managed by dairy farmers. I imagine they steward the land quite well (at least most of them). Better than any other people will, because they're connected to it. Their roots are in it. I recently read "Land! Making the Case for an Agrarian Economy" by John Crowe Ransom. He wrote this in the 1930s, and the manuscript was recently found, edited by Jason Peters of Front Porch Republic, and published by Notre Dame Press. He was most familiar with Southern farms, and makes the case that family farms' and the agrarian way's downfall came when farmers tried to mix capitalism and farming. The old way in the South, and I imagine for New England and New York too, was for farms to be primarily subsistence farms. And they were able to produce more than enough for themselves. They then sold the excess produce for the things they couldn't make or grow themselves. They would never get rich, and work would always be hard, but they led comfortable and good lives, usually. What M.E. Bradford called the "hard pastoral." If family farms were willing to do that today (and if they could get rid of any debts on their farms, first), I think they could survive. I just ordered the book at Amazon. Thanks for letting me know. I have not been to Front Porch Republic for some time. I better check in there and see what I've been missing. Many of the older farmers in the documentary I mentioned in this post remember growing up on diversified, more self-reliant farms in the 1930s and 1940s. Certainly not self-reliant to the degree of earlier farmers, but far more so than the monocroppers of today. I don't think early farmers had such high taxation to deal with and, yes, debt is surely a farm killer. It is an insidious monster. This problem will never be solved until consumers place a higher value on food and farmers refuse to work for slave wages. The farmers share of the food dollar has been shrinking for generations. We take the Lions share of the risk for the mouses share of the money. The American consumer pays less for food as a percentage of their income than anywhere in the world. It's not that more expensive food isn't within reach, it's that as a culture we value our cars and flat screen TVs. I am a farmer. Small, but not micro. I refuse to sell through the commodities system. We sell direct to consumer at a price that allows us to be profitable. Commodities is always a race to the bottom and you have to be the lowest cost producer in order to survive. Until a majority of farmers refuse to be price takers and become price makers we'll continue to lose farms. Elizabeth L. Johnson said, Reminds of "the love of money". Amen! You said what I wanted to say more succinctly than I could have said it. I work in the packaging machine industry and there are at least 4 companies making shrink wrappers. The company I work for looks for opportunities to add features that make our machines more intuitive to operate and more reliable so that customers can almost hire anyone off the street to run them. We also stand behind our machines and support them no matter the cost. We seek to avoid selling "commodity" machines. Yes, we lose sales on occasion, but you don't want those customers that are buying on price only. I also have a little brother who took over Dad's Farm. An uncle is renting land to him and I see both sides of the argument each spring. Little brother whining about the cost of rent and Uncle who knows there will be another farmer willing to pay just a little more keeps his price at the county average. Herrick, having grown up on a family farm and from largely a line of farm families I can relate. Ours was a beef operation until the mid 70's when beef prices plummeted and we switched to dairy. Small at first we grew until about a decade ago when my parents sold the dairy they were running about a 100 head. There are lots of factors involved in a dairy farm that most don't realize. Capital costs for land, either owned or rented for pasture and to grow animal feed, equipment to work the land, barns and dairy parlors, etc. We never hired on hands so it was a thankless, 24/7 job that never ended. In the end in my opinion it became a business instead of a way of life and that was a major downfall. Gone was the diversification of our earlier years. It was all dairy and the crops were all to support the dairy. A move back to a diversified farm lifestyle that could cater to niche markets while still providing family subsistence would be a viable model in my view. Whether it happens or not is the question. Elizabeth L. Johnson said, All the more the need for family gardens becoming more evident. What seems to be happening is something under capitalism, large companies acquiring large and small companies, to cut out the competition. This may be capitalism, but I don't like it at all, reflected in the loss of family farms/dairy. Thanks for seeing issues like this, Herrick, which I would never know about, otherwise. Our local dairy completely ramped up (with a grant from the state) and now they are selling to the public~ at 25% higher prices than the grocery store franchise. The public loves the milk! The dairy is actually expanding this summer to keep up with the demand.